Not to be confused with Mexican Hairless Dog. 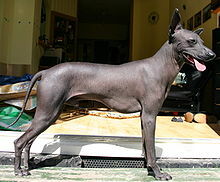 The Peruvian Hairless Dog is a breed of dog with its origins in Peruvian pre-Inca cultures. It is one of several breeds of hairless dog. Peruvian Hairless dogs are affectionate with family but wary of strangers. They tend to be very protective of women and children in the family. They are typically lively, alert and friendly with other dogs. They are agile and fast, and many of them enjoy sight-hunting small rodents. These dogs do not like to be alone, but when trained, can do well. They tend to know their allowed territories and respect it. These dogs are intolerant of extreme temperatures, although they are quite comfortable wearing clothing and will even play in the snow if dressed warmly. They generally require an owner that understands dog language and are not recommended for beginners. They learn fast, and they are very smart, but get bored easily with repetitious games like "fetch". The lack of hair leads to a reputation for being clean, for being easy to wash with a sponge, and for a natural lack of fleas or other parasites. They also do not cause typical allergic reactions to dog-sensitive humans because they lack the normal dog dander. Despite this, the dog needs care, but in another way. The skin should be washed from time to time to remove dirt and prevent clogging of pores. Baby cleaners are a good choice provided that they do not contain lanolin. Some dogs are prone to have acne or at least blackheads. The skin sometimes becomes too dry and can then be treated with moisturizing cream. Again, baby lotion without lanolin is a good product choice to soften and moisturize cleansed skin. The dogs themselves seem to prefer olive, vegetable or coconut oil, possibly because of the perfumes and other chemicals found in commercial moisturizing creams. Protection against sunlight is recommended on lightly colored/white dogs. Sun-block or other methods are beneficial to prevent sunburn. When out-breeding Peruvians typically select dark-coated dogs to ensure puppies with dark skin. Protection against cold is necessary when the dog is not able to move around at its own speed under adverse weather conditions. Sensitivity to cold may vary from dog to dog. Smaller dogs seem to be more sensitive to the cold than their larger counterparts. Even so, the dogs are kept in Puno at 3,800 meters altitude, where the average temperature is 15 degrees Celsius, and are fairly common in Cusco at 3,400 meters. The rims of the ears sometimes need special attention as they can become dry and cracked. The gene that causes hairlessness also results in the breed often having fewer teeth than other breeds, mostly lacking molars and premolars. All are born with full sets of puppy teeth, but these are not fully replaced by adult teeth as they naturally fall out, leaving them with varying levels of adult dentition. The hairlessness trait is a dominant double lethal mutation, which means that homozygotic hairlessness does not exist. Homozygous embryos, those with two copies of the gene, do not develop in the womb. This results in an average birthrate of 2:1, hairless : coated. According to Hans Räber "Enzyklopädie der Rassehunde" T.I 33% of the population is born coated. While they are recognized by the American Kennel Club (AKC) for its Foundation Stock Service as Peruvian Inca Orchid dogs, they cannot be shown at AKC shows, they are also registerable with FCI, UKC, NKC, APRI, ACR. Some breeders think that interbreeding with coated (Peruvian) dogs is required to maintain functional teeth and nervous system health in subsequent generations. They say that breeding of hairless with hairless (and common but unacknowledged culling of hairy pups from litters to maintain a "pure" image) leads to short-lived dogs with serious health problems. However, other breeders (especially in Peru) think the opposite, and are doing well (for centuries already), too. Peruvian non-breeder families typically out-breed with coated dogs every other or every third generation to keep them healthy. Like all breeds there are some health problems. These include IBD, seizures, stroke, and skin lesions. They are very sensitive to toxins and care should be taken in use of insecticides. Insecticides are absorbed through the skin, and body fat keeps these toxins from entering the liver too quickly. Since these dogs have very low body fat, toxins are absorbed too quickly and cause severe damage to the nervous system and GI tract. This is an ancient breed. Although it is often perceived to be an Incan dog because it is known to have been kept during the Inca Empire (the Spaniards classified them as one of the 6 different breeds of dogs in the Inca Empire), they were also kept as pets in pre-Inca cultures from the Peruvian coastal zone. Ceramic hairless dogs from the Chimú, Moche, and Vicus culture are well known. Depictions of Peruvian hairless dogs appear around 750 A.D. on Moche ceramic vessels and continue in later Andean ceramic traditions. The main area of the Inca Empire (the mountains) is too cold for the natural existence of hairless dogs. While they were commonly eaten in ancient times in the northern coastal areas of Peru the Inca prohibited the consumption of dogs when they conquered that region. In recent years, the Fédération Cynologique Internationale (FCI) accepted the breed and adopted an official breed standard. Before that time, in the United States, some enthusiasts created another type of Peruvian hairless dog, the Peruvian Inca Orchid. The Peruvian Inca Orchid is recognized by the AKC, and all recognized dogs are descendants of 13 dogs brought from Peru in the early 20th century. The UKC also recognized the breed in recent years. Chiribaya Dog, also known as Peruvian shepherd dog. 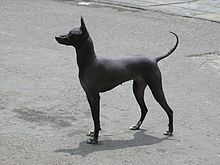 Wikimedia Commons has media related to Peruvian Hairless Dog.